If's Tasku-inssi app helps self-training driving license seekers to achieve their goals. With the app one can save their driven routes, time and kilometres, practice the theory test, and perform new driving skills. 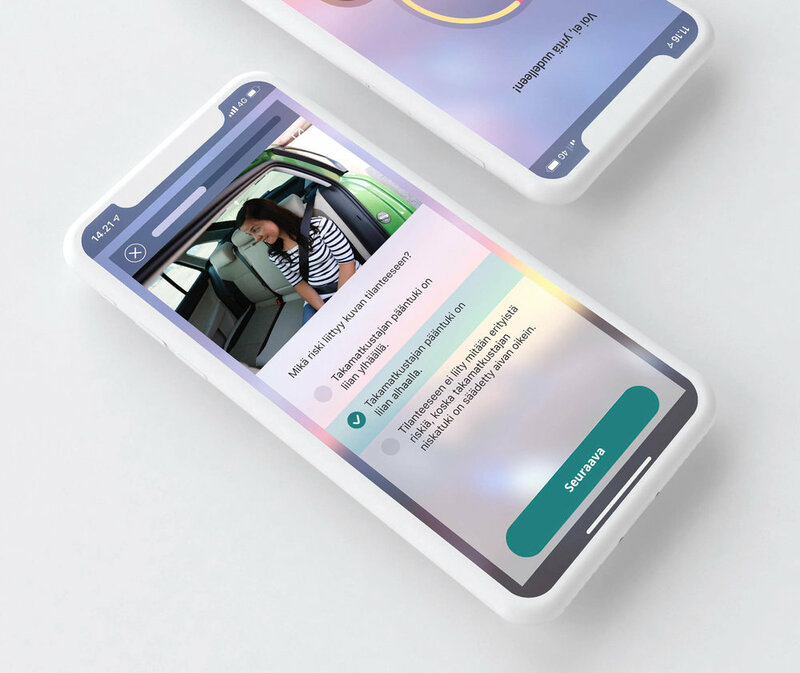 Tasku-inssi is all one needs to prepare for the driving test - conveniently on their mobile. Many youngsters learn to drive car with the guidance of their parents. It has been a common practice in Norway for years, and due to changes in legislation, a growing trend in Finland as well. Considering the project has a target group of 16-18 year old digital natives whom are more used to consuming digital products than following theory books, it felt natural to develop a learning platform and a drive log as a mobile app. Although the frame for the project was very unbounded, and the means to reach the target were left open, the goal was still very clear: to help youngsters become better and safer drivers. We wanted to make the learning more fun, and at the same time support the parents at guiding their children to become qualified drivers. The project was started with a concept creation phase with a small cross nordic team of four people: a product owner, a scrum master, a developer and a UX designer. The team was supported with lots of freedom to seek ideas for the concept. A small agile team and lots of freedom set the perfect ground for success. The setup made it possible to move forward exceptionally fast in a big corporate environment: ideate through prototyping and testing, have enough freedom for decision making, yet enjoy sufficient resources for agile product development. To guarantee all the development efforts were to add value for the customer, the team explored ideas and solutions with close collaboration with the future driver license holders. Everything from features, to visuals design and usability matters where tested and co-designed with real end-users: sometimes to find the assumptions right, and sometimes to change the direction of the development efforts. In top of the excellent setting, the team was lucky to enjoy great atmosphere of trust, mutual respect, and joyful encounters to enjoy the ride. A true dream project with a dream team of great people. Although the project was started with a small group of people focusing to launch the Proof-Of-Concept (POC) in Norway. Application is called ‘Lappen appen’ in there by the way. The project didn’t end there. After successful launch to Norwegian markets, the app got expanded to Finland, and will soon be launched in Sweden as well. The new setting opened the doors for two more product owners, one for each country, and also for a devoted tester. Not all can be predicted though, and sometimes people change companies. That happened with Tasku-inssi after the launch in Norway, as the UX designer of the project moved to Industry62. One shouldn’t fix something that isn’t broken, so the stakeholders wanted to continue the good collaboration. This led the team to be able to continue the smooth work as before. However, the new bigger team proved one claim to be true: the more is for sure the merrier. Few fundamental guidelines guided the project from the beginning: learning should be fun and rewarding, and the app should support that positive feeling and flow. We wanted the app to feel more like a good friend than a strict teacher. That aim effected many design decisions among the tone of voice of the product. Moreover, we wanted the app feel rather like playing a game than studying. The idea of gamification led us to add badges and levels to the app, as well as, many new features to the product development backlog. The wish is to support the gamification efforts also in the future, for example in form of social sharing and competing - just to mention a few. Most digital products are consumed in micro moments: during those small breaks in our everyday life when we stand on a buss stop waiting for the bus to come, or take a small break between school classes. That to be said, we wanted the app to be easygoing, rewarding to use, but also fit in effortlessly into our customers’ daily lives. An example feature, which was affected by the idea of micro moments, was the length of the theory tests. One test should be shorter than the real test, which takes around 30 mins, and easier to be perform in just few minutes. Breaking the tests into smaller 15 question junks made them also more rewarding to complete. Quicker tests also help giving constant and more frequent feedback of the progress towards mastering the whole test. The setting was perfect, target clear, If provided sufficient resources with freedom, and the team was devoted to solve the given challenges.. but was it all worth the effort? One could think that following app downloads provides enough feedback of the app’s success. That is not quite true. Although we do want to see more and more people to download the app, but what we really wish to conquer, is the youngsters to drive and use the app as well. Only by driving and practicing theory tests we can see the app to fulfil it’s targets: get youngsters to become better and safer drivers. Lean development with constant releases and learning may lead project owners to ask the question: are we ready, and if not, when will we be? It isn’t an easy question to answer, as knowledge and ideas grow the same time the project matures and customer feedback is collected. Same applies to Tasku-inssi. The project proofed its’ value within Norwegian markets, and the most important features were ready before expanding to Finland and Sweden. However, the more we have collected feedback and understanding of our customers’ needs, the more we have also produced new ideas to our product backlog. We enjoy helping youngsters to become better drivers, as much as we enjoy seeing more and more people sharing our love to Tasku-inssi. So, as long as we keep creating value to for the customers and for the company, the end is not near.